Temperature Gauges (dial thermometers) are manufactured in accordance with latest international standard ASME B 40.200, EN 13190 and supplied with . 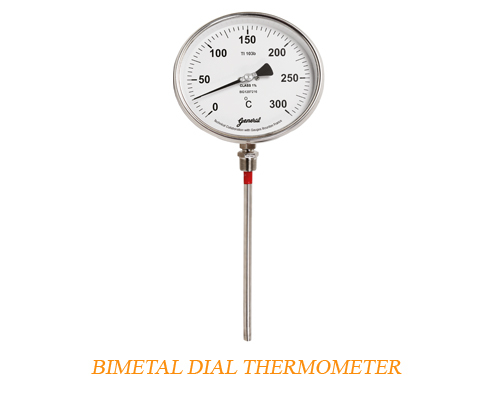 Types: Bimetal Dial Thermometers, Gas filled Dial Thermometer, Liquid Filled Dial Thermometer. Range and special features: Temperature gauges are designed to meet the various process applications ranging from temperature of (-) 200 to (+) 800 Deg C with fastest response and special features such as Hermitically Sealed Case, High Accuracy & Repeatability, Low Hysteresis, Case Compensation, Liquid Filled Case, Colour band, Capillary upto 30 mtrs without any loss of accuracy for various stem OD and length. Available in 4” (100mm), 5” (125 mm), 6” (150 mm) dial size with rigid stem having bottom or back entry as well as every angle, rotatable construction. The latest IP-68 protection is offered as standard feature for all gauges. Supplied with internal / external (as applicable) micrometer pointers as standard practice. 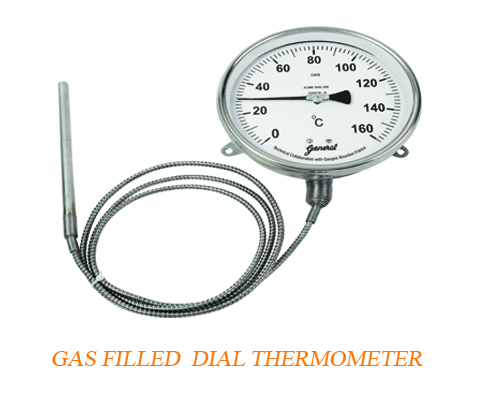 Variety of thermowells offered with Temperature Gauges, refer our catalogue for Thermowell. Certificates: Certificate of conformance, Test and calibration certificate, Material test certificates, IP Certification, etc. available.